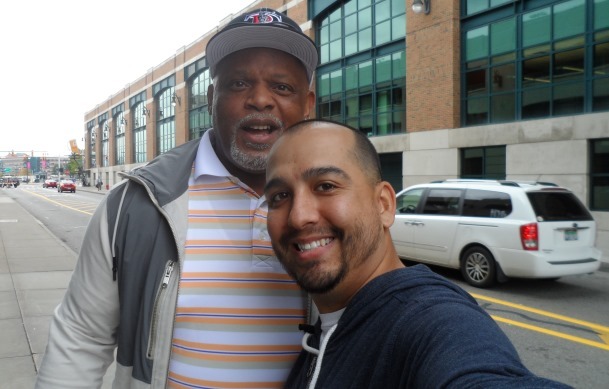 After years of what had morphed into a very acrimonious father-son relationship, it appears that the once strong bond between former big league slugger Cecil Fielder and his All-Star son Prince Fielder may be improving by the day. A month after being spotted before a Tigers game at Miami, the now 50-year-old former homerun champion was seen entering Comerica Park, prior to Tuesday's Game 3 of the 2013 ALCS. The above photo displays big Cecil posing with a Michigan based contributor to iFolloSports.com, 1.5 miles east of where Tiger Stadium (Cecil's former place of business) once stood. With Prince coming into Game 6 with zero homeruns or RBI's this postseason, maybe dad's presence will provide his 29-year-old offspring with a sudden boost of sorely lacking long ball prowess.